What Causes Awful Wi-Fi Range? Over the past weekend, the AAAD family traveled to my parents' house in Iowa. And as you'd expect, I was given several IT-related tasks. I couldn't fix any of them. The culprit? My parents abysmal wi-fi range. My parents have a pretty typical broadband setup. A cable modem, attached to a Belkin wi-fi router. Like most parents, their wi-fi network was named "Belkin0.7a" and had an incomprehensible password that "came with the router". And the wi-fi worked TERRIBLY. The router was broadcasting separate networks at 2.4 and 5 GHz simultaneously, along with a guest network. No users were capable of staying on any particular network for longer than 10 minutes. My parents only noticed this when their Netflix stopped working. AAAD was on the case! There are a number of issues that can cause bad wi-fi reception - walls, distance, interference, bad configurations, and poor equipment are the primary culprits. First thing first, I configured the settings. Re-named the network to something simple. Changed the password to something that could be remembered, instead of the 18-character jumble they were given by Belkin. Next, I moved the router to a higher spot. It had previously been on the floor, surrounded by a bird's nest of tangled PC wires. That can cause electromagnetic interference. These steps didn't really help. If I walked out of the office, I had low signal. If I walked up the stairs, I had none. I could stand in the upstairs living room, look down into the office - I could literally SEE the router - and receive no signal on the 5.0 GHz band. I realize that 2.4 GHz has more range than 5.0, but this was ridiculous. It was literally a 30-foot open-air expanse. At that point, I blame the router. It would appear that this router's signal literally cannot pass through drywall. Moreover, it also appears to have a device limit in the low teens - meaning that when 10 smartphones were in the house, NO ONE could stay on the network for long - and the wi-fi TVs never had a chance. The good news is, the AAAD household is upgrading its network - and my parents will take my hand-me-downs. My Airport Extreme A1354 will be headed to Iowa, along with at least 1 Airport Express in order to strengthen and expand the network. 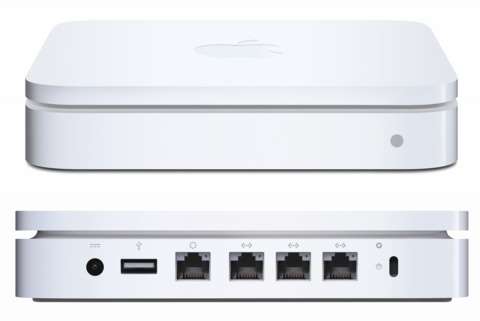 The Airport Extreme will go in the office, and the Airport Express will go upstairs. 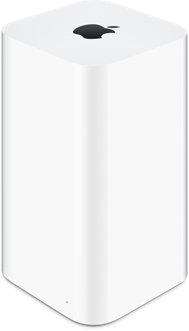 Today, I'm picking up a 2013-era "tall" Airport Extreme - either from eBay, or from the Apple Refurb store for $170. There are some big projects in play at the AAAD household - the basement project gets underway soon. And if I'm finishing the basement ceiling, I'm going to add ethernet throughout the first floor and basement, and run CAT-6 wires. Ms. AAAD has expressed interested in a home server - so we're shopping for a Synology DS415Play. Finally, it appears that we're going to upgrade the primary TV in the living room to 65", which is as much as we can fit in the new cabinets. All in all, an exciting time! Thankfully, this winter hasn't been nearly as awful as last winter - at least not so far. Perhaps you can help me. I want a simple Apple Router to use to download books from other sources.